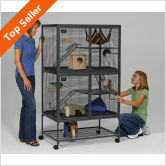 The Critter Nation Single Level cage is a great starter cage or for owners with just one or two pets. It’s sturdy and durable and a snap to clean, giving your little critters plenty of room to run, explore, exercise, and play. Every feature of the Critter Nation was designed with you and your pet’s best interests in mind. Safe latches and well-designed ramps and trays keep them safe and secure. The lockable casters on the bottom let you easily move the cage from room to room, so that you can spend the most quality time with your pets as possible. Cheaper pet store cages might be tempting but the Critter Nation Single will last a lifetime and pay for itself many times over with the time saved cleaning — not to mention how much your pets will love the space to romp, play, and frolic to their heart’s content! The trays and shelves easily slide out of Critter Nation cages when it’s cleaning time. The toughest decision many people face with a Critter Nation is which to buy. The good news is that there’s no wrong choice, and many pet owners have both the Single unit and the Double unit in their home. The Critter Nation Single Level cage is significantly cheaper than the Double but it basically has half the room and space for your pets to enjoy. 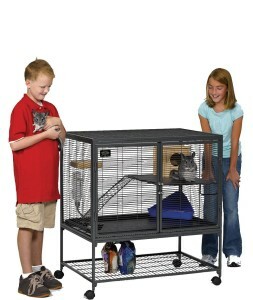 It’s the perfect cage for just one or two pets and is easier for children to clean and move around if they’re learning how to take care of their first pet. It also depends on the size of your pets, as more rats or mice can comfortably live in the Single unit whereas the same number of ferrets or chinchillas might be a little cramped.